Two years later came a greatest-hits package entitled The Hits. This album included the non-charting single "Hang In There Superman." 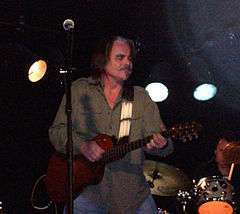 Ketchum did not appear on the charts again until 1998, when he reached number 36 with a cover of Todd Rundgren's "I Saw the Light", from his next album, also entitled I Saw the Light. Awaiting Redemption followed in 1999 without a charting single. Ketchum is also a painter and his work has been shown in Santa Fe, New Mexico’s Pena Gallery, where he had an art-show opening in 2002. He also is a master carpenter and enjoys making toys. "I Know Where Love Lives"
"Past the Point of Rescue"
"Someplace Far Away (Careful What You're Dreaming)"
"(Tonight We Just Might) Fall in Love Again"
"That's What I Get for Losin' You"
"When Love Looks Back at You"
"Every Time I Look in Your Eyes"
"My Love Will Not Change"
"Just This Side of Heaven (Hal-lelujah)"
"Keep Mom and Dad in Love"
"In Front of the Alamo"
↑ Brennan, Sandra. "Hal Ketchum Biography". Allmusic. Retrieved 2008-01-07. ↑ McCall, Michael. "Hal Ketchum — Every Little Word". Allmusic. Retrieved 2009-08-26. ↑ "RIAA - Gold & Platinum - August 23, 2010: Hal Ketchum certified albums". Recording Industry Association of America. Retrieved August 23, 2010. 1 2 3 4 5 6 Whitburn, Joel (2008). Hot Country Songs 1944 to 2008. Record Research, Inc. p. 224. ISBN 0-89820-177-2. ↑ "Hal Ketchum". Grand Ole Opry. Retrieved July 2, 2012. ↑ "Opry Member List PDF" (PDF). April 23, 2012. Retrieved July 2, 2012. 1 2 3 4 "allmusic ((( Hal Ketchum > Charts & Awards > Billboard Albums )))". Allmusic. Retrieved August 23, 2010. ↑ "Results - RPM - Library and Archives Canada: Country Albums/CDs". RPM. Retrieved August 23, 2010. ↑ "Hiatus ends for Ketchum". Country Standard Time. August 4, 2014. Retrieved August 5, 2014. 1 2 "allmusic ((( Hal Ketchum > Charts & Awards > Billboard Singles )))". Allmusic. Retrieved August 23, 2010. ↑ "Results - RPM - Library and Archives Canada: Country Singles". RPM. Retrieved August 23, 2010. ↑ "CMT : Videos : Hal Ketchum : Tonight We Just Might Fall In Love Again". Country Music Television. Retrieved October 14, 2011.